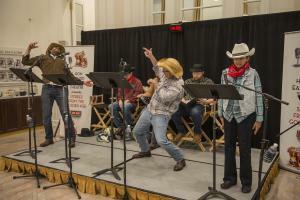 CLEARWATER, FLORIDA, USA, October 18, 2018 /EINPresswire.com/ — The L. Ron Hubbard East Coast Theatre will deliver an old-time radio-style performance of the western story, Shadows from Boot Hill, at the Scientology Information Center in downtown Clearwater, on Friday, October 26th at 6:30 pm. There is no cost to attend and light refreshments will be served. All are welcome. "Every man walks with a shadow … but what happens when he acquires a second one? Just ask Brazos who’s a cold-blooded killer for hire with blood on his hands and a posse on his trail. "As Brazos is about to discover, the Wild West doesn’t get any wilder than when a man is damned to live—and die—in the Shadows from Boot Hill*." The L. Ron Hubbard East Coast Theatre is a volunteer group founded in 2011. Their shows combine talented actors, costumes, lighting and sound effects to bring the exciting pulp-fiction stories written by L. Ron Hubbard to life. L. Ron Hubbard was among the most prolific and popular writers of the 20th century. Indeed, between 1934 and 1940, some 140 L. Ron Hubbard tales appeared in the pages of legendary pulp magazines—often as many as three titles an issue and bylined under some fifteen pen names. With 19 New York Times bestsellers and more than 350 million copies of his works in circulation, Mr. Hubbard is among the most acclaimed and widely read authors of our time. “These performances are one of my favorite things to do! They are so entertaining! I feel like I am back in the 40’s,” said Francine, a regular guest. Seating is limited. To reserve seats or to learn more about the event, contact Amber Skjelset, Manager of the Scientology Information Center at 727-467-6966 or amber@cos.flag.org<mailto:amber@cos.flag.org>. The Scientology Information Center, located in the Historic Clearwater Building in downtown Clearwater, opened on July 11, 2015, and currently houses a gallery of audiovisual displays with some 400 videos. The Center is open to all and provides a self-guided tour showing basic Scientology beliefs, Churches around the world, ongoing social programs and the life of L. Ron Hubbard, Scientology's founder. The Center offers tours to the broad public and civic leaders; holds concerts, theatrical performances and receptions for the community; and opens up the use of its conference room to social, civic and non-profit groups. For more information on Scientology, visit http://www.scientology.org or the Scientology Network on DirecTV channel 320, or streaming at http://www.scientology.tv or apps at appleTV, fireTV and ROKU. *Boot Hill: The name for the burial grounds or cemeteries of gunfighters, or those who “died with their boots on.” Used chiefly in the American West during the 19th century.